Lacy Barnes’ acting career is just beginning, but this movie may be the end of it. Starring in a movie with Hollywood’s hottest actor seems like the dream, but when it starts to look like someone is trying to sabotage her on set, and she also has to deal with her new tutor, Donovan, she has to figure out how to keep her plans from falling apart. Kasie West never fails to write in an entertaining, lighthearted style that gives way to serious moments and swoon-worthy romances perfectly. I also loved the setting of this book. Celebrities and moviemaking is a trope/genre I always adore in books, and Kasie West’s take on it was really fun yet realistic. Like I said, I love anything movies/acting wise, and this book is no exception. I loved the drama on set, and the issues Lacey must deal with to start her acting career. The mystery aspect was also interesting. I The mystery was compelling. I liked the characters, but they definitely aren’t my favorite Kasie West characters. While they were still entertaining and good, they sometimes felt a little too superficial. The side characters weren’t as likable as most of Kasie West’s books, because you never knew who was out to get the main character. 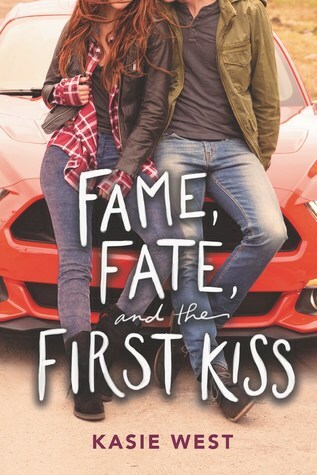 Fame, Fate, and the First Kiss is an adorable contemporary if you’re looking for something to warm your heart during the cold winter. I just put this book in my blog. The post is about the books that coming out this month.